Francesca battles her mother, Mia, constantly over what's best for her. All Francesca wants is her old friends and her old school, but instead Mia sends her to St. Sebastian's, an all-boys' school that has just opened its doors to girls. Now Francesca's surrounded by hundreds of boys, with only a few other girls for company. All of them weirdos, or worse. Then one day, Mia is too depressed to get out of bed. One day turns into months, and as her family begins to fall apart, Francesca realizes that without her mother's high spirits, she hardly knows who she is. But she doesn't yet realize that she's more like Mia than she thinks. With a little unlikely help from St. Sebastian's, she just might be able to save her family, her friends, and - especially- herself. There’s something about Melina Marchetta’s writing that just makes me irrevocably happy. This is my third book of hers, and by the end of each book, every single time, I end up feeling happy and like something inside me has changed. 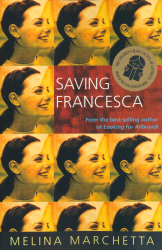 Saving Francesca was, obviously, no exception. I always go into Melina’s books a bit hesitant, I don’t really know why but I always do, however by about page 30 or so I’m completely in love and there’s no turning back. 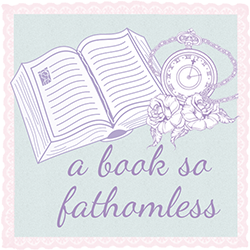 I don’t know what it was about Saving Francesca that made me suddenly fall in love, but before I knew it I’d reached the end and I was desperate for just a few more pages. I think that’s always the sign of a good book, when you reach the end but you know it’s not going to be enough. Luckily, in this case there is a companion novel so I won’t be completely without the characters I fell in love with here. Francesca is a really great character. She is definitely flawed, but there are parts of her that I could connect to and I could understand (most of) her reactions to the events in the book. Her group friends are completely amazing. They’re so fun to read about and they’re all so different – it’s especially great to see how their friendship evolves through the book. I can’t choose a favourite, I love all of them equally. It’s such a fun book, it’s just easy to get through and it feels so short. It is only 243 pages long, but it feels even shorter than that. I’m still sitting here 24 hours later just desperately hoping that I somehow missed out on the final page or something because I just need more. Now we’ve reached the part of the review where I tell you all to pick up this book if you haven’t already because you seriously NEED it in your life. You may think you’re all good without it, but I’m telling you – just read it. PS. Your new blog design looks fantastic!